As with most of the Gottlieb games from the early to mid 1960’s it features the great, clean artwork of Roy Parker. The backglass depicts a marching band led by majorettes and toy soldiers with a castle in the background. 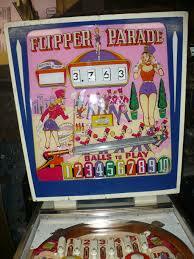 Flipper Parade is an add-a-ball game. Each game starts with five balls, but the players have an opportunity to earn extra balls throughout the game. The back glass illuminates the number of balls to play – up to 10.